The all-new Corolla XLi Exclusive runs on a 1.6-litre in-inline petrol engine that churns out 122.6 PS of max power and is mated to a 7S multidrive gearbox. The car also displays best-in-class fuel economy of 18.1 kmph. Do you want to buy this limited edition Corolla? Spare AED 75,500 to bring it home. Corolla is available in 8 different colors - Silver Metallic, Grey Metallic, Super White, Black Mica, White Pearl Crystal Shine, Beige Metallic, Red Mica Metallic and Phantom Brown Metallic. Toyota Corolla has been one of the world’s best-selling cars since its introduction in the year 1966. This executive sedan has undergone ten generations with various changes and still holds a huge market in all parts of the world. This particular sedan has been a preferable choice for the Emirates for a fairly long period of time. Currently running in the eleventh generation, it carries a refined design that gives a sleek look and makes it feel upmarket. In addition to a comfortable ride, it offers a high level of safety features. The Toyota Corolla competes with Honda Civic and Hyundai Elantra in the UAE Market. In terms of interior, the Corolla 2018 inherits most of the features from its previous versions. The layout of the dashboard is kept unchanged but central console design is modified and a new touchscreen system has been introduced. The steering wheel is wrapped in leather with new steering mounted controls. The 12V sockets are replaced by USB ports and the entire cabin has been improved. The audio system is well designed and music is streamed to passengers via a set of 4 speakers. The responsive touchscreen in this sedan is featured with voice recognition and navigation. Moreover, Multi-Information Display (MID) allows you to follow information but one of the best feature added in this version is the smartphone MirrorLink that gives a breakthrough when compared to its competitors. The old air vents are completely modified with new circular air vents. Corolla 2018 is best suited for four passengers where driver seat is equipped with electrically adjustable feature along with auto dimming rear-view mirror. This interior will give you much comfort with adequate boot space and trunk space of about 470 liters. The Corolla 2018 looks very much sporty and modern that will attract you at the first glance. The major changes in car’s front are the thin and narrow chrome grille along with the new bumper with sleek fog lamps embedded in. Likewise, long and slim headlights of the car that are embellished with LEDs is a welcome change. This sedan has an auto tilt-down wind mirrors that will help you while reversing it by giving proper visibility of the ground. The windshield is very well designed to reduce noise entering into the vehicle and gives a quiet ride. At the back, it has been provided with detailed tail-lights and chrome-tipped single exhaust pipe. The dual tone tail-lights merge with the chrome line on the bootlid to give it a modern and unified look from the back. A sunroof can also be found on the top of the selected variants. The sides of this sedan are not much changed but have got the stunning 16” alloy rims in many variants. As far as the dimensions are concerned, the car is 4620 mm long, 1775 mm wide and 1460 mm high. This C-Segment sedan comes with two different engines for UAE market segregated into three different variants - 1.6L, 1.6L Sport, and 2.0L. The inclusion of VVT-I technology further improves the performance and fuel economy considerably. The Toyota Corolla 2018 is deployed with 4-cylinder engines, where the 1.6L engine is capable of tattling 121 hp at 6,000 rpm while the 2.0L unit delivers 143 hp power at 6200 rpm. Power is routed to the front wheels either via a 7-speed Multi-driver transmission. The advanced 7S Multi Drive transmission system works well with the engine and provides greater fuel economy. This car gives you an average mileage of around 18.1 kmpl for the 1.6-litre engine and 16.5 kmpl for the 2.0-litre engine. This engine works well and maintains a great balance between refinement and performance. It has a great sound isolation ability and gives you the needed comfort while driving. The improved suspension system in this version handles larger bumps on the roads with high stability and provides you with a good performance and smooth ride. If you are looking for a sedan with consistent performance without compromising on the comfort front, Corolla is the right pick. This Corolla 2018 is equipped with top-notch safety features. In the 2.0L variant, it offers driver seat and front passenger airbag along with curtain, side and knee airbags. Along with this, it is incorporated with an effective braking system using Electronic Brakeforce Distribution (EBS) and Anti-lock Braking System (ABS) to provide a safe braking. It also has Brake Assist (BA) which reduces stopping distance drastically by offering high braking force. The 2018 Toyota Corolla also gets electronic door lock system and security alarm feature that alerts you in case of theft attempts. The immobilizer is a special feature in this sedan that prevents the engine from running with the unauthorized key, another feature for theft protection. The Corolla has Vehicle Stability Control (VSC) that prevents the vehicle from spinning and provides great grip on slippery roads using the Traction Control Feature (TRC). It is also equipped with International Standard Organization Fix (ISOFIX) that enables protection for the children seat. It is equipped with a total of eight sensors at front and back which makes parking very easy even in congested areas. Toyota's unmatched reliability and smooth engine of Corolla makes it a worthy contender in the C-segment sedan market. For the ones, who look for brand's trust and past track record, Corolla is the right choice. 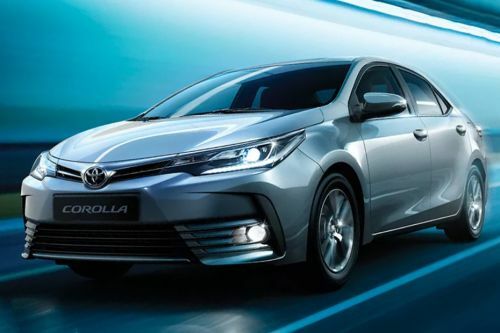 On road prices of Toyota Corolla in starts from AED70,900 for base variant 1.6L SE, while the top spec variant 2.0L Sport costs at AED100,800 .